The small community of Chambers in east Arizona adjoins I-10 at the US 191 intersection (exit 333), 25 miles from the New Mexico stateline. The place has a high desert setting, surrounded by grassy plains at an elevation of 5,750 feet, bordered to the south by the seasonal Puerco River and a railway line. The only facilities are a gas station, motel, and a school which serves a large, dispersed neighborhood, extending to the nearby Navajo Reservation. 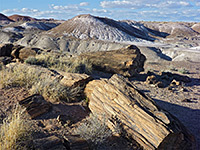 Although there is little of interest nearby, the land becomes much more colorful 20 miles southeast, at the edge of the Painted Desert and Petrified Forest National Park. The next closest NPS unit is Hubbell Trading Post National Historic Site, 45 north along US 191. Apart from a gas station next door and I-40 to the front, Days Inn Chambers is surrounded by undeveloped desert land, part of the Navajo Indian Reservation, but is just 20 miles from the northern entrance to Petrified Forest State Park. The inn has the traditional two floor, exterior corridor design and offers all the standard amenities, including a hot tub, outdoor pool, free internet access and free continental breakfast. There are no other chain hotels alongside the interstate for 50 miles in each direction, until Gallup in the east and Holbrook to the west.